SR-71 EC03-0082-1: NASA's SR-71B and F-18 HARV aircraft left Edwards Air Force Base, Calif., on March 24, 2003. 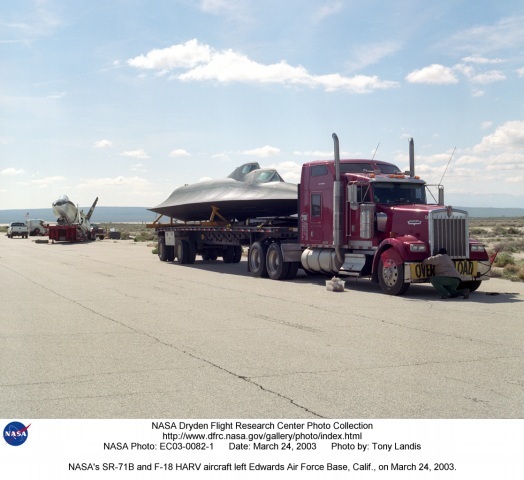 NASA's SR-71B and F-18 HARV aircraft left Edwards Air Force Base, Calif., on March 24, 2003. Dryden Flight Research Center's SR-71B Blackbird aircraft, NASA tail number 831, is destined for the Kalamazoo Air Zoo museum in Kalamazoo, Mich., and the F-18 High Angle-of-Attack Research Vehicle (HARV) aircraft, NASA tail number 840, is going to the Virginia Air and Space Center in Hampton, Va.
NASA's SR-71B was one of only two SR-71 trainer aircraft built, and served NASA in that role, as well as for some high-speed research, from 1991 to 1999. The F-18 HARV provided some of the most comprehensive data on the high-angle-of-attack flight regime, flying at angles of up to 70 degrees from the horizontal. The HARV flew 385 research flights at Dryden from 1987 through 1996.